The relationship between clinical pharmacology and clinical pharmacy has been periodically discussed over the past 40 years.1,–,4 The goal of this commentary is not to rehash old arguments but rather to point out how acutely each profession needs the other in 2012 and beyond. Global economics, a demand for quality cost effective drug therapy, a pharmacological armamentarium of increasing complexity and new choices for the best and brightest students combine to drive clinical pharmacology and clinical pharmacy together. This commentary was invited on the basis of a presentation at the American College of Clinical Pharmacology Annual Meeting in Chicago, Illinois, USA in September 2011. The presentation focused on the US situation, so I apologise in advance for any comments that might not pertain to the situation in the UK and Europe. However, I think that the situation that I will discuss very much pertains to the American and the UK/European situation. The focus of this discussion is critical problems facing both professions that should drive them together at the present time. In the case of clinical pharmacology, the lack of a critical mass of practitioners to deliver clinical pharmacology's public health commitment may very well serve to weaken and ultimately destroy the profession. In the case of clinical pharmacy, the struggle to bring cutting edge science into clinical pharmacy practice may sentence the profession to mediocrity in a decade that will see large numbers of ‘doctorate’ level practitioners in nursing and other health professions. What is clinical pharmacology, and does clinical pharmacology have a public health commitment? I would encourage you to read this excellent history of clinical pharmacology. The answer to ‘What is clinical pharmacology?’ is directly addressed by Sir Dollery, and it is (a) a laboratory discipline of pharmacokinetics, drug metabolism and pharmacogenomics, (b) a design and data analysis profession of experimental protocols, drug utilisation and pharmacovigilance and (c) a clinical profession of ‘hands-on’ patient care, clinical investigation of drug interactions and adverse effects, and consultancy as an expert in drug therapy. As Sir Dollery explains, this wide expanse of knowledge and expertise is both a strength and a weakness. As an example, the US Food and Drug Administration Office of Clinical Pharmacology consist of 150 clinical pharmacologists/pharmacists, and we continue to struggle with having the expertise to address new and emerging science and therapies. So there is little question that clinical pharmacology has a public health commitment for providing expertise for the most complex drug therapies in a ‘hands-on’ manner. A quick check of the mission and vision statements of the two US clinical pharmacology organisations, ASCPT and the American College of Clinical Pharmacology, confirms that clinical pharmacology has a responsibility to patient care. The European Association for Clinical Pharmacology and Therapeutics is a bit more subdued in its aims, but still suggests that improvement of drug therapy in patient care is a major tenet held by the organisation. Clinical pharmacology certainly had its roots in innovative patient care and clinical trials. Sir Dollery describes this as ‘The age of excitement’ for clinical pharmacology, and the list of clinical pharmacologists leading new hospital services at that time reads like a list of legends of the profession. However, this was during the 1950s and 1960s, and Sir Dollery himself admits that the expansion of clinical pharmacology was fuelled by expanding clinical service and research budgets. The 1990s brought the restructuring of the healthcare industry, and the disappearance of clinical pharmacologists from hospital wards. Given the current global economic situation, which is leading to new restrictive economic healthcare models, the suggestion made in 20067 that the government fund the traditional physician model of clinical pharmacologists in hospitals is beyond consideration now and in the future. Although the origins of clinical pharmacy were different than that of clinical pharmacology, the two professions essentially reside in the same space today. The American College of Clinical Pharmacy's definition of clinical pharmacy8 embraces all of the parts of Sir Dollery's definition of clinical pharmacology, with the exception of being a laboratory based discipline. Clinical pharmacology's emphasis on a laboratory based research is replaced by clinical pharmacy's emphasis on an independent patient oriented practice and cost effectiveness. In other aspects related to generating new knowledge and improving drug efficacy and safety, the two professions have identical goals. The dramatic change that may not be well known to people outside of the pharmacy profession is the growth of the number of people educated at the doctorate PharmD level in the USA. In 1990, the American Association of Colleges of Pharmacy mandated that the PharmD would be the entry level degree, resulting in about 8000 PharmD graduates yearly in the USA at this time. Since more than 90% of pharmacy students enter pharmacy school in the USA with a bachelor's degree, the 8 year educational programme parallels physician training in the USA. On a global basis, the PharmD degree is now being offered in Africa, Asia, the Middle East, Europe and throughout North America presently, and there are many other entry points into clinical pharmacy, including masters degrees and specialised residencies or other training programmes. This growth is reflected in the number of clinical pharmacists who are academically based, who have residency and fellowship training, and who offer sophisticated clinical services for patients. Many of these clinical pharmacists in the USA are members of the American College of Clinical Pharmacy, which now has over 12 000 members. In contrast, membership in the US clinical pharmacology organisations has been stagnant for at least a decade (figure 1). Clinical pharmacology organisations have all but closed their eyes to this development, despite their inability to mount any plan to meet their public health commitment. The American College of Clinical Pharmacology has about 100 PharmD members, and ASCPT does little better with about 300 PharmDs. 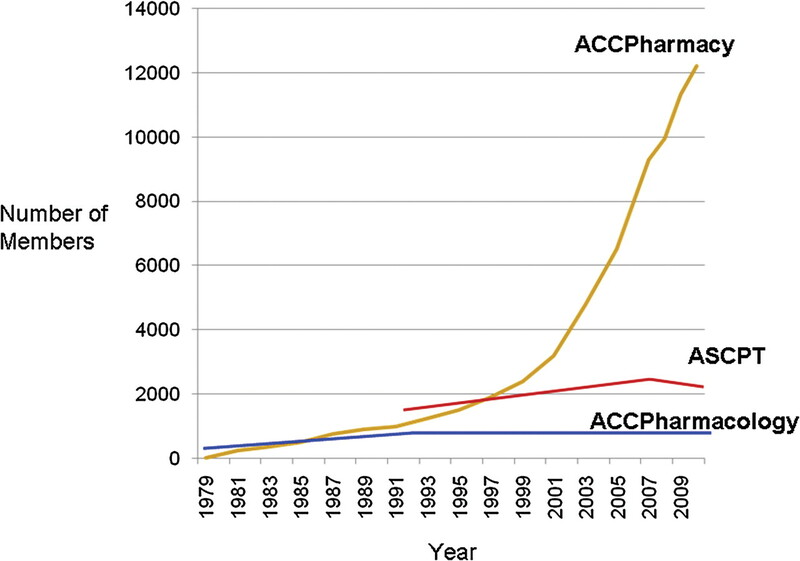 The growth of membership in the American College of Clinical Pharmacy (ACCPharmacy) versus the growth of the two major US clinical pharmacology organisations, the American Society of Clinical Pharmacology and Therapeutics (ASCPT) and the American College of Clinical Pharmacology (ACCPharmacology). Why should clinical pharmacy embrace clinical pharmacology? While clinical pharmacy includes clinical research and has a number of highly respected researchers, clinical pharmacology still represents the majority of drug development pharmacologists in the world. Information on new drugs, basic studies of drug–drug interactions and dosage adjustments required by renal or hepatic dysfunction are primarily generated during drug development by clinical pharmacologists. Solving complex patient drug problems requires cutting edge scientific knowledge, and increased opportunities exist for clinical pharmacists to collaborate with clinical pharmacologists to address these problems. The marriage of clinical pharmacy and clinical pharmacology keeps the science in patient oriented pharmacy services, and that is essential for delivering the highest quality services and for recruiting the best people to clinical pharmacy/pharmacology. An unstable future lies ahead if we do not keep science at the forefront of pharmacy practice and research. Other health professions are quickly moving toward full doctorate programmes. Nurses particularly see the professional doctorate (Doctor of Nursing Practice or DNP) as the best route forward. In 2008 there were 375 794 nurses in the USA with a masters degree and 28 369 nurses with professional doctorates of nursing. In 2010, 153 schools of nursing gave out 7037 doctor of nursing degrees, and the number of students graduating with DNP degrees will soon surpass the number of PharmD degrees in the USA. Doctors of nursing will be involved in managing drug therapy through evidence based patient management. Bringing pharmacology and the new breakthroughs in drug development into patient care is essential, and clinical pharmacists are uniquely positioned to do this. Clinical pharmacology similarly needs clinical pharmacy. Clinical pharmacology has already been deleted from many medical school curriculums, and few physicians see clinical pharmacology as a viable career option. Most clinical pharmacologists today are our PhD colleagues, and while they drive the science of clinical pharmacology, they will not be able to take care of the public health commitment of clinical pharmacology. How can the courtship of clinical pharmacology and clinical pharmacy proceed? I think that our professional societies can have a leadership role in this interaction. Clinical pharmacology organisations can have immediate benefits in joint programming with clinical pharmacy organisations by increased attendance at their training programmes and in their membership. Clinical pharmacy organisations benefit through joint programming by bringing the highest quality regulatory, academic and industry speakers to their meetings and educational programmes. Many clinical pharmacists want to distinguish themselves, and training with and collaborating with top clinical pharmacologists is certainly one method of doing that. I would recommend that clinical pharmacists attend clinical pharmacology programming and consider membership in clinical pharmacology organisations. Clinical pharmacology organisations should seek out clinical pharmacists who have a high level of clinical practice and clinical research. A critical axiom of strategic planning for any profession or organisation is that if you are not moving forward, you are in fact moving backwards. Clinical pharmacology and clinical pharmacy should carefully consider their current situation, and make this a marriage that society and patients everywhere will benefit from. Clinical pharmacy and clinical pharmacology have many reasons to work together to further patient care related to drug therapy. The opinions included in this commentary are those of the author, and should not be interpreted as the position of the US Food and Drug Administration.
. Relationship between clinical pharmacology and clinical pharmacy. J Clin Pharmacol New Drugs 1972;12:384–92.
. An overview of clinical pharmacy and clinical pharmacology. J Clin Pharmacol 1981;21:238–40.
. A proposal for clinical pharmacy and clinical pharmacology collaboration—the time has come. Drug Intell Clin Pharm 1986;20:310–11.
. Clinical pharmacology and clinical pharmacy: competition or collaboration? Ther Pharmacol Clin Toxicol 2009;13:33–40. American Society of Clinical Pharmacology and Therapeutics. 2011; What is clinical pharmacology? http://www.ascpt.org/KnowledgeCenter/WhatisClinicalPharmacology/tabid/6665/Default.aspx (accessed 24 Jan 2012).
. Clinical pharmacology—the first 75 years and a view of the future. Br J Clin Pharmacol 2006;61:650–65.
. The future of clinical pharmacology in the UK. Lancet 2006;367:1051. American College of Clinical Pharmacy: The definition of clinical pharmacy. http://www.accp.com/docs/about/ClinicalPharmacyDefined.pdf (accessed 24 Jan 2012). European Society of Clinical Pharmacy: What is clinical pharmacy? http://www.escpweb.org/cms/Clinical_pharmacy (accessed 24 Jan 2012).